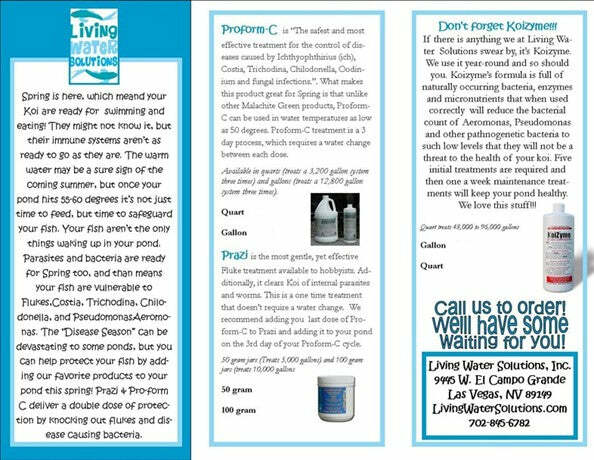 Did you know that Living Water Solutions’ owner, Kent Wallace, writes a featured column in Koi Nations Magazine? You can find great articles written by Kent in every issue of Koi Nations! Don’t use swimming pool equipment for ponds! - Pond requirements are very different. Don’t let anyone tell you that you don’t need a bottom drain! bottom drain is a must. Don’t put rocks on the bottom of your pond! pond water. You won’t see it as algae but simply different colors on the pond floor. Don’t have a shallow pond! Do consider the long lifespan of koi! Do add a UV light! Do add protective areas in the pond design! Do go as BIG and as DEEP as you can! water conditions are more stable. Don’t add fish all at once! expensive. These fish will assist in starting your bio filter. Don’t over stock your pond! Don’t add fish or plants from unknown sources! death and great expense. Plants can carry pathogens and parasites. introduced to your pond may kill every fish in your pond. - Only feed your fish as much as they can eat in 5 minutes. Don’t let your family and friends surprise you with gifts of fish and plants! - Some one is likely to do this for you not realizing the risk, so let them know. Don’t forget to remove the chlorine from the water before adding fish! Do take advantage of your local AKCA Koi Club! Do let your pond “season”! Do test your water daily during the initial start up phase! - Usually about three weeks. Do test your water weekly thereafter! You will be surprised at how relaxing it is spend time with your fish. Pond filtration is not adequate or poorly installed. this filtration system and delivers them to the garden or sewer system. then delivered to the filtration system where it is cleaned and returned to the pond. would enter the final stages of filtration lowering efficiency and increasing maintenance. vortex tank the debris flushes into the garden or sewer. the tank and sends it to the bio-mechanical filter. bio-mechanical filtration system is the last stage of filtering your pond. filtration. (500 gallons of filtation/5000 gallon pond). required when the system becomes restricted or you notice a change in water quality.